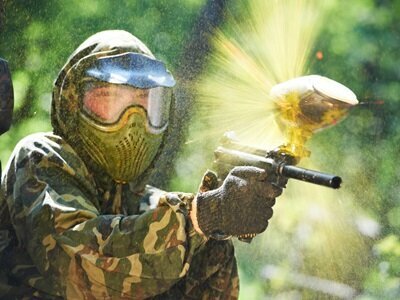 Everybody loves paintball, after all, what is more fun than shooting other people with paint guns? But for that, you need some paintballs and of course, a gun, but guns come in different shapes and grades of quality, and one of the most important qualities is the velocity of the paintballs it shoots. 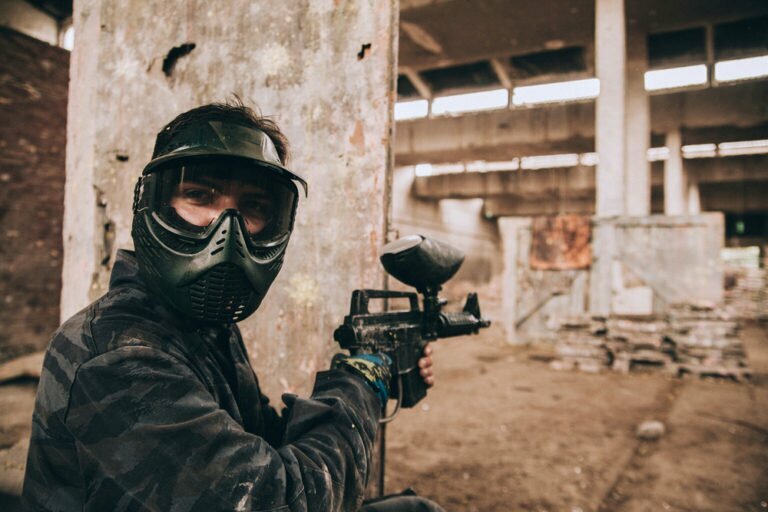 Below, you will find everything you need to know about the best high-velocity paintball guns and also why it is a good idea to invest in one. 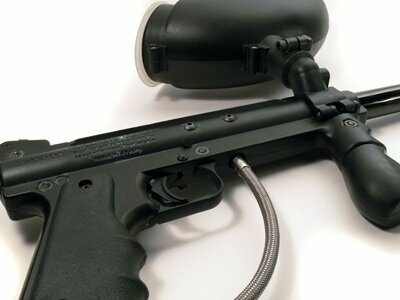 This is a highly stylized military marker, and this particular paintball gun comes with AirEfficient EKO Valve system. The shooting capacity is also enormous, and it can fire 1500 shots from the CO2 tank of 20 oz. The rail mounting system, matte anodized finish, two finger trigger and the polymer clamping with high impact are some of the important features of this paintball marker. There is a system called Quick-Disconnect pin which is also very important in the battlefield. There are also other features which make this marker more special like the vertical fore with high impact polymer. The trigger frame is made up of aluminum and comes with a Delrin-bolt with pull pin top cocking. The hose is braided with steel and operated by compressed air or Co2. The spring guide/velocity adjuster is a handy feature along with anti-double speedball detent. Therefore, it is very clear that this particular device comes with lots of exciting features which makes it an ultimate weapon. Though there are lots of other paintball markers in the market, Spyder MR100 PRO Semi-Auto is a unit which is very popular nowadays due to its highly stylized attributes and also the machine gun-like feel which it generates. This paintball marker is not at all heavy and is very comfortable to carry during the action. On top of that, the Spyder markers are also available in different colors with semi auto function that current users are extremely happy about. Next up is a highly-popular paintball marker that comes with a UL frame. For unparalleled toughness, it uses extremely durable fiber/nylon glass composite. Therefore, the user will have complete control over the marker, thanks to its brilliant hour-glass shape. There is also an integrated LED light which acts as an indicator for your marker. Each and every piece is treated with utter precision through multi-phase honing. The result of this process is a great 6-micron mirror finish that ensures that there will be no hassle (air turbulence) by eliminating the spin of the ball that results in increased accuracy. There is also an eye pipe made up of polycarbonate which is designed to improve the overall user experiences on the field and prevents the broken paint and dirt from getting into the eye of the user. The bolt tip-O ring helps in cleaning the seamless pipe on every firing cycle. The fuse bolt in this gun is updated which induces to produce a comparatively low pressure of 140psi which ensures consistent accuracy, minimum recoil, and a smooth firing cycle. The improvement of the hyper regulator is also a noticeable upgrade in this model. Overall, this particular model is consistent, smaller, and sleeker paintball marker that offers the user the ability to determine the exact air pressure and helps in improving accuracy. The new shim stack reacts much quicker to changes in the pressure and is highly responsive which ensures smooth flow. We discussed the MR100 here above, but this one comes as a whole package with everything that you need in order to dominate the field. This gun can fire 1500 shots from the 20oz CO2 tank. There is a two finger trigger, polymer clamping, and the rail mounting technology that make this gun one of the most sought-out paintball marker on the market. 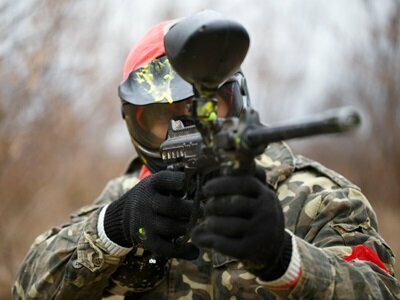 Equipped with a Delrin bolt and pull pin top cocking, you will be well on your way to master the art of paintball. Therefore, it is very clear that this particular device comes with lots of exciting features such as the anti-double speedball detent. Apart from this high-quality gun, it also consists of other lucrative accessories like GXG XVSN Mask that includes both Visor and Anti-Fog Lens. Moreover, it comes with 3Skull 20 oz Co2 Tank w/ pin valve and 3Skull 200 rd Black Hopper. Additionally, this package also includes 3Skull 21 inch OrangeJerk Squeegee and 1oz Gold Cup Oil. On top of that, there are other accessories which make this whole package a great combo, like the Ultimate Paintball Clear Tubes of 6 – 140 Round and 3Skull 6+1 Deluxe Paintball Harness. This a great marker to use and with all the cool accessories offered here, it is undoubtedly a great buy, and this whole package of goods is really worth a buy as it almost covers all the basic things which you need for going into the battlefield. This marker is made up of a lock down clamping feed neck with O-rings that are color coordinated. This gun comes with a hyper 3 regulator, and there are ultra-light 45 frames and adjustable trigger with reach trigger. The specialty of this model lies in different sections and design. Apart from being extremely lightweight, this unit features a pistol-shaped design. The light weight makes this marker more accessible among a wide range of users. This marker is also engineered in a way to ensure that there are minimum recoil and smooth cycles of firing. It also has a wide range of variants of different colors. Moreover, the gun is sleeker, smaller and compact than any other marker in the market today. Additionally, the air pressure is balanced so that there is no turbulence while firing. While shooting, though light weight, this gun is stable and offers a very little recoil as it is engineered flawlessly to ensure a great experience while playing. Overall, it has a compact feel and offers excellent stability while firing, which makes this marker so popular among a huge section of paintball players. Pump Action: Ever wanted to feel like you are in an action movie, wielding a shotgun like Bruce Willis? Pump action paintball guns work pretty much like a shotgun, where you pump it, and it loads a ball, then you pull the trigger, and it flies out of the barrel. Although really cool, pump action guns are not very practical, after all, who wants actually to charge every shot separately? Because of that, pump action paintball guns, which are some of the oldest models in existence, are slowly being replaced by newer types. Semi-Automatic: This type is probably the most common type of gun in the paintball market. 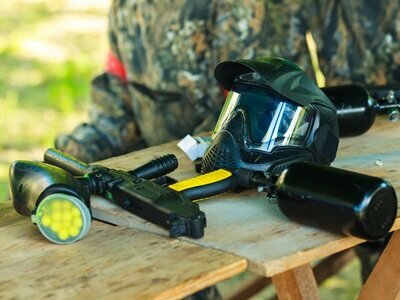 Semi-automatic paintball guns require you to pull the trigger once for one paintball to be fired, and the ball is fired using a gas mechanism that includes CO2 or a compressed air tank. Usually, semi-automatic paint guns are the most accurate ones, because of higher velocity paintballs in such guns and also you have more control over your fire-rate that results in more accurate shots. 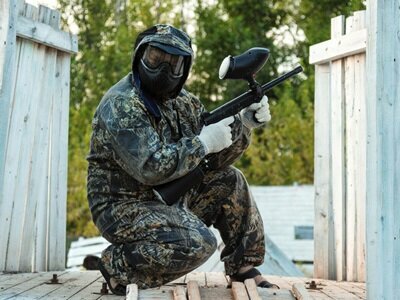 Fully-Automatic: If you want to take the step further and become completely automatic during gameplay, there are some paintball guns that use an electric system to shoot a constant flow of rounds at the enemy, with only one pull of the trigger. Although it looks really cool when fired, it is dangerous, and some arenas and tournaments even prohibit the use of fully-automatic weapons in combat. One of the reasons why paintball guns are deemed to be high or low quality is the velocity of the projectiles that come out of it. Some guns are slow when firing, and some are fast and it is important to get a gun that shoots a projectile as fast as possible. The reason is not that you unload a magazine faster but because faster bullets are more accurate, and can hit targets faster and without too much diversion from its course. Let’s say you have 2 guns: one with a fast velocity bullet and one with a slower one, and you shoot both of them at the same time towards the same target, trying to be as accurate as possible. The thing that will happen is that the faster projectile will both hit the target faster than the slower one, and will nearly always be more accurate. Therefore, if a bullet travels at a low speed, the wind, humidity and other variables have more effect on the ball, and because of that, it will be a lot easier for a ball to be diverted off its designated course (towards the target) and miss. However, if the ball moves faster, all the effects caused by whatever is in the air, whether it’s wind, temperature, humidity, pressure – will be dampened down and will have less and less effect on the ball. The reason is that the ball will barely move away from its course, and it will hit the target almost all the time. The same principle happens with real guns and one of the reasons why high-caliber sniper rifles are more accurate is because of the extreme amounts of gunpowder in the bullet casing. Therefore, when the bullet is fired and the gunpowder is ignited, it creates more force and pushes the bullet faster down the barrel than most other guns. This is an important issue to discuss and let’s say that you have now found two paintball guns that cost the same, but they have 2 things that are completely different. One gun can shoot an extremely large number of paintballs very fast, but all the paintballs are slow and inaccurate, while the other gun cannot shoot more than 2 rounds a second, but each one of the rounds packs its punch in their velocity. If you play in a small CQB (Close Quarters Battle) arena, it might be a better idea to choose the first option, because accuracy and velocity probably won’t matter if the range is short. However, if you are in the open, and you are playing in an area bigger than 120ft across, and if you would have used the sub-machine-gun over there, you would probably miss almost every shot with it, leaving yourself vulnerable to any offensive from the opponents. But you wouldn’t have this problem with high-velocity guns because you would probably hit the target the first or second time, and you wouldn’t have to waste so much ammo. A world-class high-velocity gun will cost you more money than a budget weapon, but there’s a silver lining: You will always need to buy paintballs, which you will fire at the enemies when in the game. Therefore, when you miss a shot with a paintball, it’s gone, and basically, it was wasted for nothing, and the opponent is still on his feet without being hit. This is one of the reasons why a high velocity (and accurate) gun is extremely useful and can save you money. If you waste a lot of paintballs, by using an inaccurate gun that shoots them everywhere, you will end up paying a lot more than you would for a more expensive yet efficient gun. 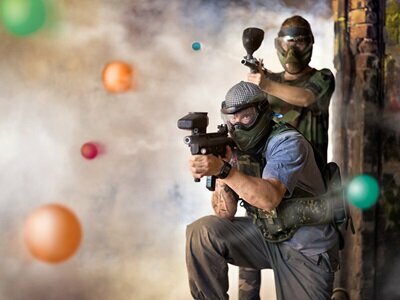 Furthermore, if you are patient with your shots and focus more on accuracy with a high-velocity paintball gun, you will end up saving money on buying a new pack of paintballs. Therefore, you save money over the long haul. After all of the things we have discussed above, there is one thing you should remember: Upgrading to a better, industry grade high-velocity gun will pay off after a while, both in terms of enjoyment at the end of the game, and the money it can save you. You can think of it this way, the money you save with a high-velocity gun can be used for many other upgrades that will boost your gameplay significantly. Therefore, the next time you go to buy yourself a shiny new paintball gun, take into account the importance of accuracy and high velocity.